At Somerset House in London, the Man Booker International Prize has announced its six-title shortlist for 2019, a group of books translated from five languages into English. They come from five nations on three continents. And as it happens this year, only one of the 12 people behind these books—six authors and six translators—are male. Six of the translators and five of the authors shortlisted are women. The shortlist also is dominated by independent publishers this year, five of the novels announced having been published by smaller houses, and two bearing the distinctive, austere covers of Fitzcarraldo Editions—which published last year’s winner, Flights by Poland’s Olga Tokarczuk in English, translated by the American Jennifer Croft. Media messaging for the shortlist announcement tonight indicates that in the month following Tokarczuk’s win last year, sales for Flights increased 692 percent. The book has become Fitzcarraldo’s bestselling title to date. Tokarczuk appears again on the shortlist this year for her novel, Drive Your Plow Over the Bones of the Dead, translated by the UK’s Antonia Lloyd-Jones, whom Publishing Perspectives interviewed along with author Zygmunt Miłoszewski in 2016. Drive your Plow is already on its fourth printing, a success considered to be partly thanks to last year’s Booker International win. The largest house represented on this year’s shortlist is Hachette, the parent company of Quercus Books and its MacLehose Press imprint, which publishes Juan Gabriel Vásquez’s shortlisted novel, The Shape of the Ruins. The Arabic writer on the list is Oman’s Jokha Alharthi, the first author from the Arabian Gulf region to have been longlisted and now shortlisted for the prize. And Spanish is the original language of two of the shortlisted titles, The Shape of the Ruins and The Remainder. This year is the last time the Booker International Prize will have “Man” in its name, after the Man Group announced this January that it would not continue as the Booker Prize Foundation’s primary sponsor. As Publishing Perspectives has reported, the American fund called Crankstart will begin its newly arranged sponsorship after the May announcement of this year’s winner, succeeding almost two decades of sponsorship by the Man Group. And keep in mind that this is not the Booker Prize for Fiction. The Man Booker International Prize is a younger award established in 2005 to honor an author and translator equally for a work of fiction translated into English. The prize is awarded every year for a single book, which is translated into English and published in the UK and Ireland. Novels and short-story collections are eligible. Authors and translators are considered to be equally important, with the £50,000 prize (US$65,175) being split between them. In addition, each shortlisted author and translator will receive £1,000 (US$1,303). 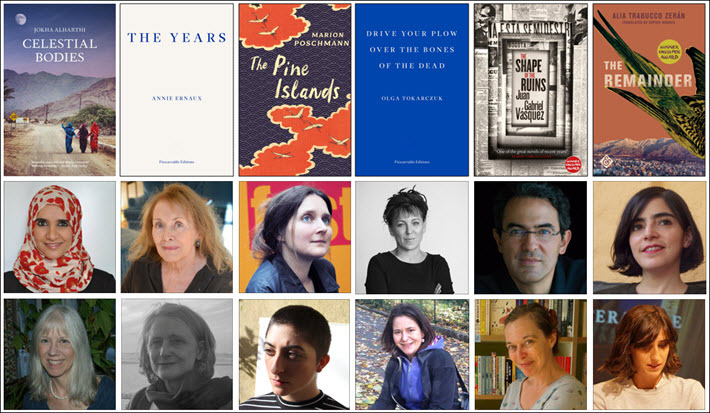 Books eligible for consideration in this year’s competition have been published in English in translation by UK publishers between May 1, 2018, and April 30, and the jurors, who were announced in July, began with a pool of 108 books. Their longlist, announced in March during the London Book Fair, comprised the traditional “Booker dozen” 13 titles. Elnathan John; and essayist and novelist Pankaj Mishra. The winner of the 2019 Man Booker International Prize is to be announced on May 21 at a formal dinner event at London’s Roundhouse. More from Publishing Perspectives on both Man Booker Prize programs is here. And more from us on international publishing and book awards programs in general is here.